There is no college, or institution, that one can become certified to teach the Reggio Emilia method. In fact the Reggio Emilia method doesn’t even exist outside of the town of Reggio Emilia, Italy. No two children learn exactly the same, nor does a group of children learn the same way over an extended period of time. Loris Malaguzzi, and parents in the villages around Reggio Emilia in Italy recognized this right after the second world war. They believed that children between the ages of three and eight needed a new way of learning. They sought to instill an educational system that was child centric where children’s curiosity, thoughts, comments, and knowledge are valued and respected as any other adult’s would be. Their vision has now grown into a world-wide phenomenon. It is one of the driving forces that wants to see early child development education made a priority around the world. Children that learn under the Reggio Emilia inspired curriculum are more apt to solve problems on their own by researching to find the answers. This style of learning is centered around the interest, and needs, of the child as they relate to their local community. Therefore, what’s good for the children of the village of Reggio Emilia is not necessarily good for the towns, and villages, of the rest of the world. Each institution that chooses to use the values of respect, responsibility, and community through exploration and discovery can only call themselves Reggio-inspired. Within these Reggio-inspired classrooms, and programs there are three components that come together to form a child’s education. Parents are the largest component of the Reggio Emilia philosophy. Teachers, or co-learners, respect that parents are a child’s first teacher. Parents are school partners, collaborators, and advocates for the child’s education. They are consulted often in every aspect of the child’s curriculum. Parents are encouraged to, and often times, volunteer their own knowledge to help all the children receive a more rounded education of the community. The instructor is the second part of a Reggio-inspired child’s education. Each of these individuals has dedicated themselves to the life-long pursuit of the learning process. As the community changes so do the children, the educational expectations, and the way they learn. Reggo-inspired teachers are more than just instructors. They are co-learners, and collaborators, with your child. 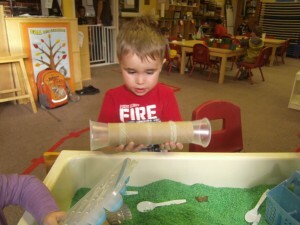 Our co-learners facilitate and plan activities based on a child’s interests. They ask questions to further understanding and engage in the activity with the child. They are considered to be on the inside of the learning instead of sitting back and watching. The final piece to a Reggio-inspired education is the environment in which a child learns. 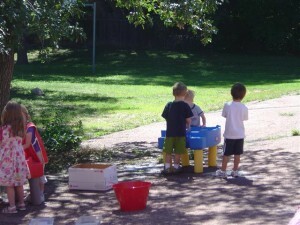 The environment is important because children make connections and understand their world in places that support “complex, varied, sustained, and changing relationships between people, the world of experience, ideas and the many ways of expressing ideas,” according to Louis Cadwell in her book Bringing Reggio Emilia Home. 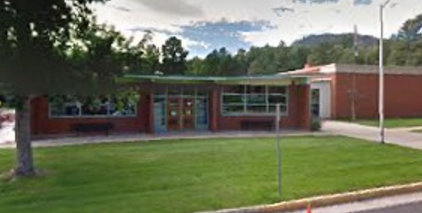 Many of these classes have live plants, lots of natural light, and our within walking distance of playgrounds and activities. Children express themselves in “a hundred languages” based on the Reggio-inspired curriculum. They are encouraged to paint, draw, color, dance, perform plays, and any other number of ways children communicate with the world around them. At the root of Reggio-Emilia is community, communication, and respect. Click here to register with North American Reggio Emilia Alliance.